If you’ve been reading up on the latest industry trends from industry 4.0, then you’re probably aware of the positive impact that semi-automatic and automatic drum filling systems can have on the speed and quality of your processes. At some point, you’ve realized you’re going to need drum filling equipment designed for just the purpose. They’re more efficient, built to purpose, they prevent over and under filling, and they keep the quality and consistency of each drum the same while reducing the operating cost and speed of completely manual filling processes. But you now need to know which filling system or equipment is going to work best for you. 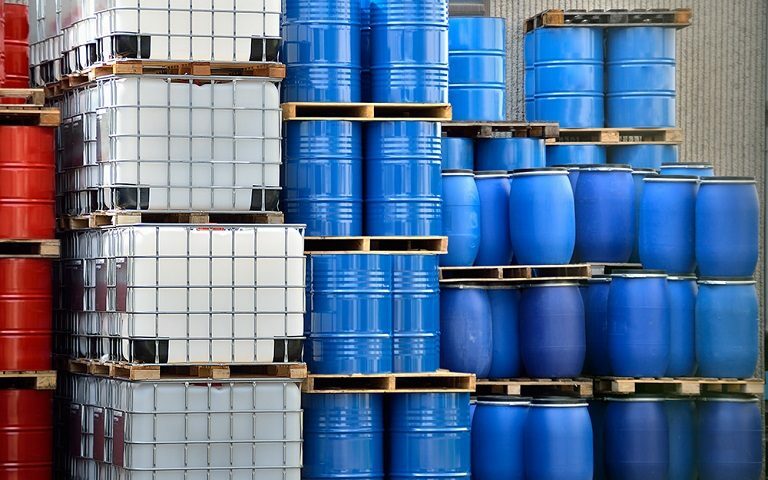 – Are we filling drums, IBCs, or both? – Is the material we’re filling hazardous? – How automated do we want to have the system? – Are we going to fill drums one at a time or four to a pallet? – Does this need to connect to our PLC? Each one of these questions is going to help answer whether or not you need a single, semi-automatic system or a multi, automatic drum filling system. But before we begin, it’s important to note that all of METTLER TOLEDO’s drum filling systems are able to be upgraded to be used in hazardous our sanitary areas. 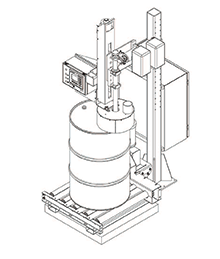 The distinct difference that makes a drum filling system semi-automatic, is the need for the presence of an operator. The operator will need to align the lance with the bung of the drum or IBC as well as press the start button to begin filling. This doesn’t necessarily mean the operator needs to start and shut off the flow of the fill, but merely set the fill limit and the capacities within the terminal and let the terminal do the shut off. The manual portion of this is selecting the tolerances you’re looking for as well as pushing the “start” button. What makes the systems semi-automatic is the ability of the lance to raise automatically during the filling process using METTLER TOLEDO’s system, Raise by Weight. Most manufacturers use a top filling feature where the lance is lowered into the top of the bung and fills from the top of the drum or IBC. Sub-surface filling is when the lance is lowered completely to the bottom of the container and filled slowly. This will submerge the lance in the material that’s being filled. The submerged lance prevents splashing of the material and is beneficial for substances that are prone to foaming an hazardous situations. Sub-surface filling begins at the bottom of the container with “dribble mode”. This mode is a much slower fill that prevents initial foaming. Once the lance is submerged, the system switches to a faster fill, ensuring drum filling efficiency and preventing foaming. During this faster fill, the lance raises out of the drum while remaining submerged until the container is filled to the specified weight. Surface filling is similar to sub-surface filling in that it still prevents material from foaming. This application is when the lance lowers completely into the drum or IBC and begins filling from the bottom. During the process, the lance stays just above the material as it slowly raises, keeping the material from touching the lance. 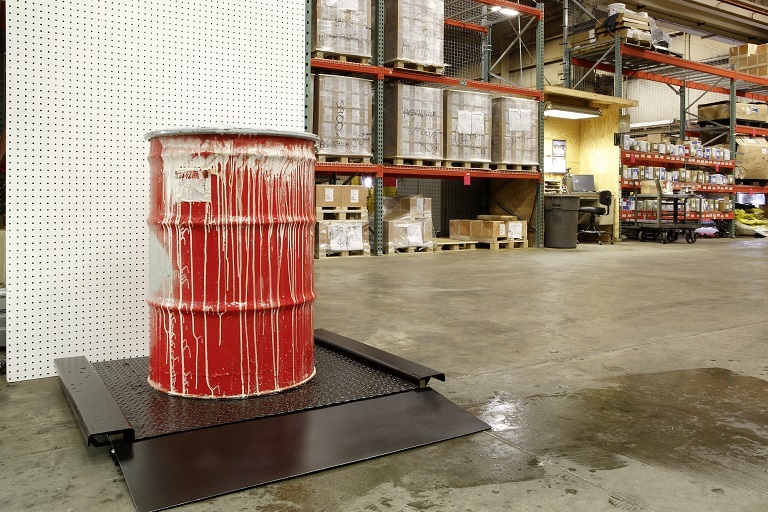 Surface filling is beneficial when dealing with high-viscosity liquid or hard to clean and potentially hazardous liquid like ink. If you’re looking for a basic drum filling system that’s specifically designed to fill drums and IBCs and upgrades your current manual process, the MT-T55 from METTLER TOLEDO is going to be the one for you. This system is built with simplicity in mind, allowing for only one drum to be filled at a time. 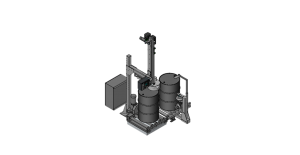 The semi-automatic single drum filler is useful in applications where the production goals can be met with a slower throughput. 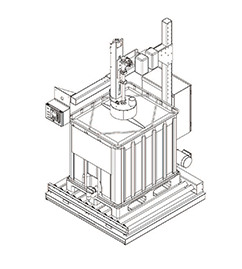 The system, as all of the METTLER TOLEDO drum systems do, easily integrates into your current fill line. Once the drum or tote is placed under the lance, the operator would then press ‘start’ and begin filling utilizing the standard IND570 terminal. As the system begins filling, the lance automatically raises with METTLER TOLEDO’s built in application, “Raise by Weight”. Fortunately, the terminal stores 200 preset product information such as pre-fill target, filling tolerances, final cutoff delay, and much more. But that isn’t all; the integrated IND570 Panel mount terminal even comes standard with Ethernet TCP/IP capabilities and Allen Bradley CompactLogix™ PLC communication. If you’re looking for more product specs on the MT-T55 Semi-Automatic Single Drum Filler, you can check them out on our MT-T55 specs page. 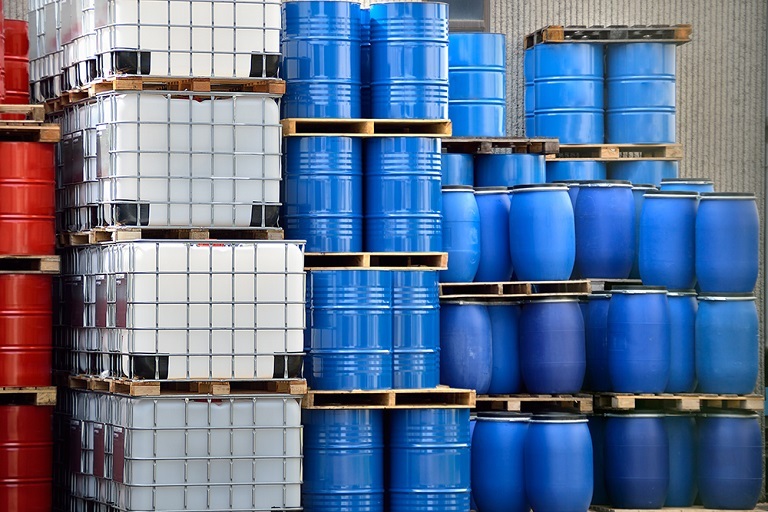 But of course we understand that not everyone is simply filling 55 gallon drums. That’s why METTLER TOLEDO offers an almost identical filling system to the MT-T55 but designed to fill totes and intermediate bulk containers (IBC). 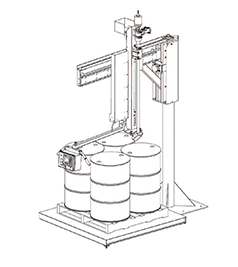 The main difference in this IBC filling system versus the single drum filling system is the mobility of the arm and the lance. Because the area at the top of an IBC or tote is much larger and allows for different placements of the bung, the arm on the system is able to be slide forward or backward to any position above the tote to locate the opening. The MT-275 and MT-330 are both designed with the appropriate bases to accommodate either a 275 or 330 gallon IBC with ease. 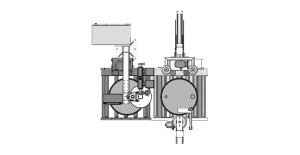 Instead of being designed using a two-axis system, the pivot style is designed with the ability of the main arm to extend outward or retract backward. But that isn’t all. 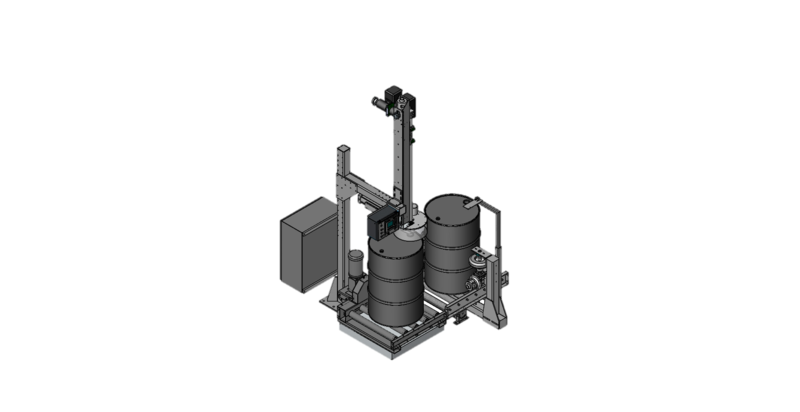 The versatility of this model allows for the filling of multiple drums, different sized drums, and even totes and IBCs with its adjustable height and XY positioning. The operator simply places the lance over the bung of the drum and presses ‘start’ on the terminal. With the preset weight and fill data, the lance will lower itself into the drum depending on the type of fill that’s being used and will raise itself out as it fills. Automatic systems are usually defined as equipment that can fill a container without operator interference. An automatic system is considered fully upgraded with a vision system that allows the station to locate each opening to each drum in addition to controlling the height of the lance. Filling in an automatic system isn’t limited to starting and stopping; the system can be 100% automated on a conveyor line complete with photo eyes for drum orientation or lance position, automatic lance height adjustment, and fill values. Imagine it. The conveyor line starts with 4 drums on a pallet. The pallet moves into the system and stops, using photo eyes, the lance locates the bung of the first drum and lowers itself to the base of the drum. As the system fills, the lance slowly raises up automatically until it has reached the fill value in tolerance. When the first drum is complete, the lance locates the second bung and repeats the process. Once all four drums are filled to tolerance, the conveyor system moves that pallet off and brings in the next one. 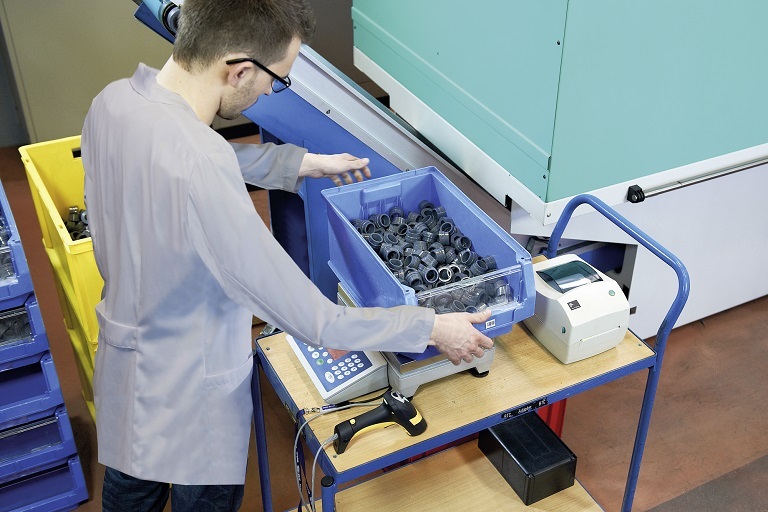 In some cases, semi-automatic drum filling equipment can be upgraded to perform tasks automatically, like the Cognex Vision System upgrade as well as the orientation station. For semi-automatic filling systems, METTLER TOLEDO offers an Orientation Station that easily integrates into your existing line. The station uses photo eyes to locate the opening of the drum and spins the container to the correct position for the lance prior to entering the filling area. Once the drum enters the filling area, the lance will be in position to lower itself. If you’re looking for a simple application yet still want to maximize efficiency for single drum applications, then the MT-T55A is going to be your system. It has the same designs as the MT-T55 Semi-Automatic Drum Filler except it has the addition of air powered height adjustment. Unlike the pivot style system, the MT-T55A’s lance is limited to a fixed XY positiong, meaning the bung of the barrel must be located in the same plane as the lance. However, the ‘A’ at the end of MT-T55A stands for ‘adjustable’, meaning the height of the lance is adjustable to fit multiple sizes of drums. Using METTLER TOLEDO’s Orientation Station would convert this filling system into a 100% automatic application. The MT-55T Auto is a system designed to fill multiple drums or a single 275-330 gallon tote. This system becomes fully automated when the Cognex Vision system is implemented as an upgrade as well. Just to reiterate, the Cognex Vision system is a photo eye feature that will locate the bungs of each drum or your tote, regardless of positioning and begin the filling process without operator intervention. You could have a fully automated, multi-drum and IBC filling system with the MT-55T Auto! 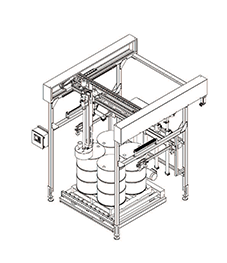 Integrate the system into an automatic conveyor line. When a pallet of 1 or more drums reaches the filling system, the system then locates the first bung. Pulling data from preset fill levels and tolerances, the filler lowers the lance into the drum and begins filling. As the system fills, it slowly rises out of the drum, preventing lance submersion, foam, and possible hazardous filling situations. Once the scale has recorded one drum being filled, the filling system locates the second drum and repeats the process. When the filling system sees that all 4 drums have been filled to their specified weights and tolerances, the conveyor kicks on and moves on to the next set of drums. And Voila! 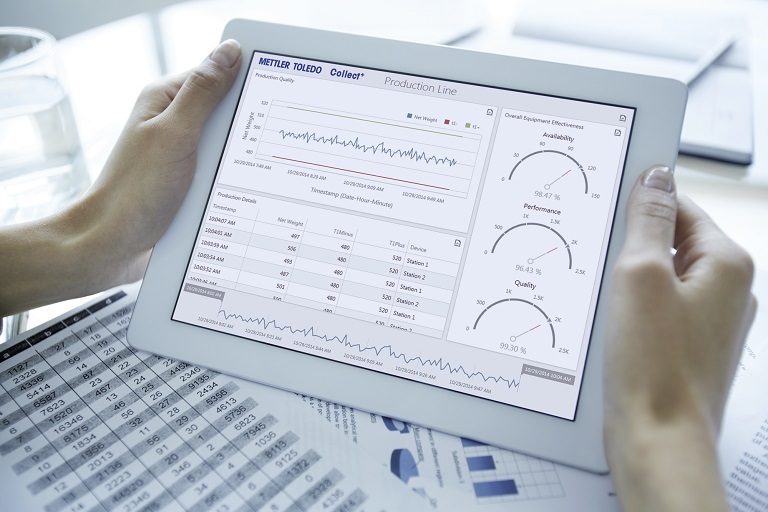 You’re on your way to become the king of Industry 4.0! But of course not before having the integrated IND570 terminal record your weighing data either internally or with proprietary software like Collect+ for data collection and quality assurance. In the entirety of this blog post, I’ve covered all the different kinds of drum systems METTLER TOLEDO has to offer in terms of overall functions. Semi-Automatic – Fixed systems are systems where it requires the operator to engage the filling process by pressing ‘start’ on either the terminal or remote button as well as align the lance of the fill system with the bung of the drums or IBCs. Since the lance is in a fixed or semi fixed position, typically the position or rotation of the drum is going to be required prior the lowering the lance. Semi-Automatic systems that are classified as fixed can be upgraded by including an orientation station prior to the fill area. This, however, does not affect the fixed position of the set height of the lance. The variable style of the drum filling systems are ones that allow the lance to be moved to locate the openings of the drums or tote rather than the drums needing to be adjusted. 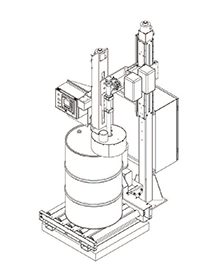 The Pivot style of the METTLER TOLEDO’s drum filling systems allow the lance to be adjusted on all three of the XYZ planes, compensating for the orientation of the drums as well as the height of the container being filled. Just like the Semi-Automatic – Fixed category, the Automatic – Fixed drum systems would require the adjustment of the drums or totes in order to align the bung with the lance. What makes these systems automatic is the Cognex Vision System that automatically locates the bungs of the drum and fills. In this situation, an operator would not need to be involved during any of the filling process. The Automatic – Variable systems are really what make a production lines cutting edge. It’s the pinnacle of what Industry 4.0 is all about. A fully upgraded system will locate each bung of each drum automatically on a guided rail system as well as raise and lower the lance as needed to adjust for varying heights of containers. Integrate these features with the Allen Bradly PLC communication and control the conveyor line in addition to the fill. However, a PLC connection isn’t necessarily needed. You can also control the same processes with the digital I/O built into the integrated IND570 terminal! If you’ve been teetering on the edge of upgrading your current drum filling application to a system that is designed for that purpose, then now is the time. If you aren’t sure whether it would be feasible with your current set up or are concerned about whether or not it will require drastic changes, give us a call or reach out to us. We’ll provide a free consultation all the way from reviewing your physical limitations to the technical digital limitations of your existing system. Start looking at upgrading today and increase throughput, save time and money, and increase efficiency with a METTLER TOLEDO drum filling system!